Hilt: sheet iron, of "figure of eight" design. Blade: usually flat-backed, occasionally fullered. Blade length: approx. 21- 30 inches. Scabbard: Black leather with brass locket - rarely encountered. Up until the late-eighteenth century, short swords or hangers had been the mainstay of edged weapons for ordinary British sailors whilst on board a ship of war. They were not issued to every man and it was usual to have one between five or six sailors. The introduction of a tubular, smooth gripped cutlass in the 1790’s (figures 1. and 2.) was the first serious attempt by the British Navy to introduce some kind of uniformity into the supply of cutlasses to naval ratings. 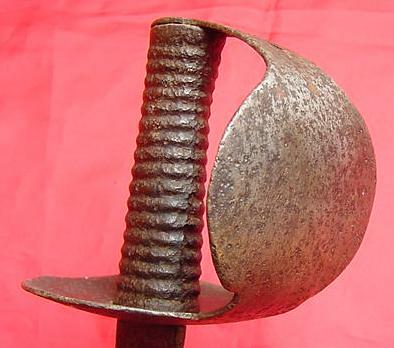 It had a distinctive “figure of eight” rolled iron hilt that varied considerably in thickness. 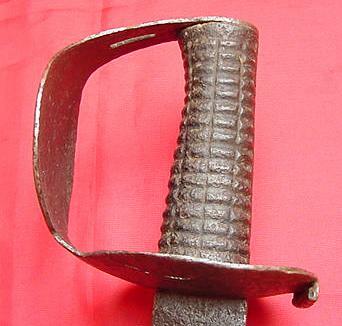 There is some debate as to the origin of this style of cutlass and it has been suggested that they might actually be traced back to earlier American designs, particularly during the Revolutionary War. 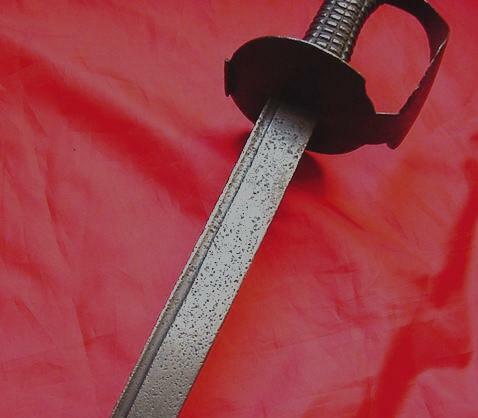 The fledgling American Navy issued a cutlass (Model 1797) which bears a great resemblance to these British cutlasses and it is probable that the British actually copied the design from the Americans. These cutlasses are sometimes found with greatly deformed hilts due to the thinness of metal, and many have breaks or cracks to the guard. Blades differ both in length and thickness, but are normally straight (although I have seen the odd slightly curved blade), with single, narrow fullers. Occasionally, they are maker marked with a government inspector’s stamp to the blade forte. Makers include James Woolley, Thomas Craven and Henry Osborn. There are many variations of this early cutlass, and contracts were given to a wide number of sword-makers, who all interpreted the design in their own peculiar way. The smooth gripped cutlass is much lighter than the later ribbed grip British cutlassses. Due to their use in saltwater, it is rare to find one without medium to heavy pitting. I would be suspicious about any that are in very good condition. I have seen a number of copies, most notably of the 1804 Pattern. No attempt has been made to age these cutlasses, and blades are smooth with no age wear. These early cutlasses would invariably have been supplied with a brass mounted scabbard or no scabbard at all. Scabbards are rarely seen, and most would have been discarded soon after they were issued on board ship. Cutlasses were normally kept in racks without scabbards in order that they could be quickly on hand for action. Unlike swords issued to individual soldiers in the British Army, cutlasses were issued to the ship itself, rather than the seaman. Little or no training was given in the proper application of the cutlass, and it was expected that the sheer bravado and raging blood lust of the British sailor, would be enough compensation for any shortfall he may have had in the niceties of sword-play. The cutlass was primarily a hacking and slashing weapon, with the human head being the natural target for any boarder. In 1804, the Board of Ordnance ordered 10,000 swords from a pattern supplied by Henry Osborn of Birmingham. There does not appear to be any evidence that the authorities laid down strict criteria for this new cutlass, and Henry Osborn was probably working on his own initiative. The most notable aspect of this new design was the ribbed iron grip and heavier, longer blade. 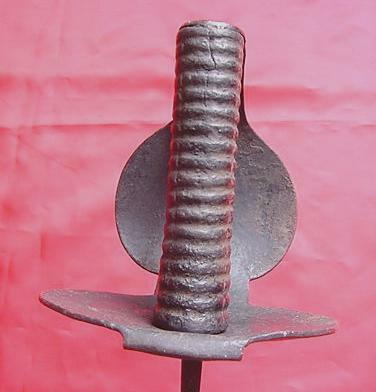 The disc hilt is also more developed and thicker than in earlier cutlasses. Most of these 1804 Pattern cutlasses would have been made between 1804 and 1816, as the Board of Ordnance did not order any more cutlasses for the Navy until 1841. This pattern of sword is relatively scarce and most are in poor condition (as expected for a sword used in saltwater conditions). It is copied and there are some well made examples in the market - spurious sellers have been known to artificially age them. IF SO, YOU NEED TO PURCHASE THESE FULL COLOUR BOOKS!! CLICK IMAGES TO BUY YOUR SWORD BOOKS! !